Engineers from Aalto University mapped various human bodily sensations connected to emotions. Seven-hundred volunteers were exposed to a range of emotional videos, pictures, and stories. They were then were asked to map parts of their computer-generated silhouettes where they felt any increased/decreased activity. 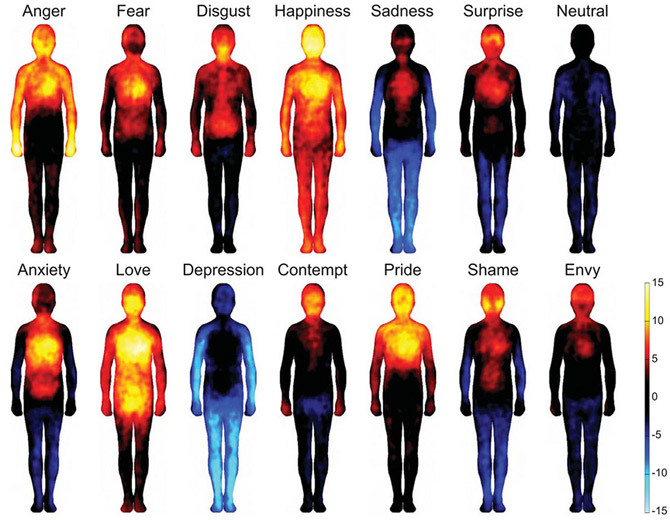 The results show in which part of the body the emotion is felt. It also shows that happiness and depression are the most contrasting emotional states. The least activating emotions in the head area are sadness, neutral and depression. The most approach-related emotions, such as love, anger, happiness, and pride activate the arms, while the chest area is activated experiencing most of the emotions, except for neutral emotion and the state of depression. In the graphic above, warm colors indicate regions of increased sensation while blue and black areas represent decreased sensation. Emotions coordinate our behavior and physiological states during survival-salient events and pleasurable interactions. Even though we are often consciously aware of our current emotional states, such as anger or happiness, the mechanisms giving rise to these subjective sensations have remained unresolved. Here we used a topographical self-report tool to reveal that different emotional states are associated with topographically distinct and culturally universal bodily sensations; these sensations could underlie our conscious emotional experiences. Monitoring the topography of emotion-triggered bodily sensations brings forth a unique tool for emotion research and could even provide a biomarker for emotional disorders. This entry was posted in Educational, Interesting and tagged Education, Interesting, Love, Science. Bookmark the permalink.